Modern Masters 2017 Edition takes players back to some of the most remarkable planes from recent history, including Innistrad, Ravnica, Zendikar, Mirrodin, Lorwyn, and Alara. Players will have the opportunity to relive the excitement of these past sets and enjoy a fresh Limited experience that combines some of their most iconic cards and mechanics in new ways. This will be the first reprinting of Damnation in a set since it first appeared in Planar Chaos. The “enemy fetch lands” from Zendikar are always a hot topic with Commander players as well as competitive Constructed players. 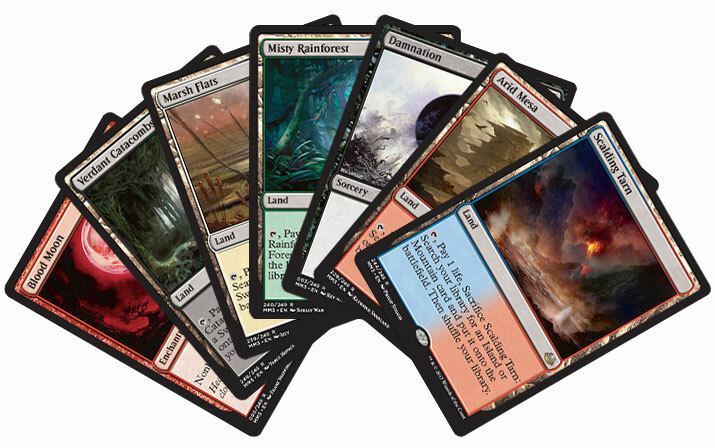 Additionally, the popular Flashback, Miracle, and Populate mechanics will be returning with the set. Flashback enables players to recast spells from their graveyards. Miracle can save the day with powerful effects for low mana cost when drawn at the right time. And Populate creates an army of token creatures. Try striking up a conversation around these iconic reprints and mechanics at your store and on your social media channels to build excitement. Modern Masters 2017 Edition is a fun and unique experience that was designed around theBooster Draft format. One display perfectly supports an 8-player Booster Draft making it an ideal purchase for a group of friends who all want to experience the set together. Get advice from Jamison Sacks of Common Ground Games on how he takes full advantage of products like Modern Masters 2017 Edition to provide specialized events for his players. The Draft Pass, available on the marketing materials page, under Event Accessories, can help bring the party into your store. Josh Petrik of Dungeon Games took full advantage of the draft pass to help grow his community and encourage repeat play. Phyrexian Games turned it into a one-of-a-kind reward. However, you choose to do it, make the release of Modern Masters 2017 Edition an exciting event at your store.